Was born in 788 A.D. in a Nambudri Brahmin family in the village of Kanari, State of Kerala in southern India. His father’s name was Shibguru and mother’s name was Bishista Devi. The family was a devout worshiper of “Lord Shiba”. 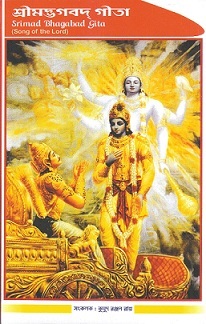 Shortly after Shankar was born his father left the mortal world. At the age of five Bishista Devi sent Shankar to Guru’s house for scriptural studies. Because of his abnormally sharp brain he completed his studies in two years and came home when he was only seven years old. One day two astrologers analyzed his birth chart and predicted that he might die either at the age of sixteen or at thirty two. At a very early age Shankar felt a strong desire to know God and attain “Moksha” (liberation of cycle of human life and death). When he expressed his desire to take “Sannyas” and renounce the family life, his mother strongly opposed it. However, Shankar convinced his mother with the condition that he would be present at the time of his mother’s death. Shankar left his house and started walking and walking. One day he noticed a beautiful “Ashram” on top of a hillock. He climbed the hill and met an ascetic on meditation. The ascetic told him that this was the abode of “Mahamuni Rissha-shringa” of the ancient age. Shankar was attracted by the beauty of the place and spent some time here on meditation. In future Shankar established an “Asram” named “Shringeri Math” at this location. Shankar set out again on foot for “Onkarnath Hill” which stands in the midst of Narmada River where it splits into two streams around the hill. His intention is to see “Jogiraj Govindapad” who is in deep meditation in this hill. On arrival he saw a few more Jogis are waiting to see the great saint who is in meditation in his cave for several years. Shankar ventured to remove the stone at the entrance and go inside and meet the Jogiraj”. When the Jogiraj saw Shankar he was very pleased and said, “I was waiting here for you. I am still alive only to see you”. Shankar spent three years on meditation in association with his Guru. One day the river Narmada was flooded and the water reached the mouth of the cave where “Rishiraj Govondapad” was in meditation. 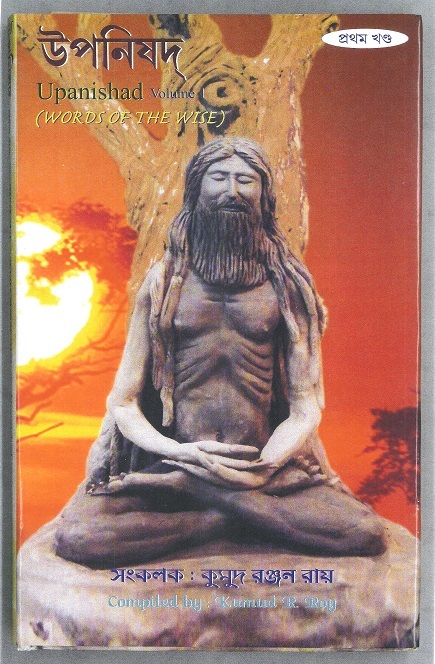 No body had the courage to disturb Rishiraj’s meditation. When Shankar saw his Guru’s life was in danger, he applied his divine power so that level of water do not rise around the Guru’s cave. After Gurudev woke from his meditation, he heard everything from other disciples. 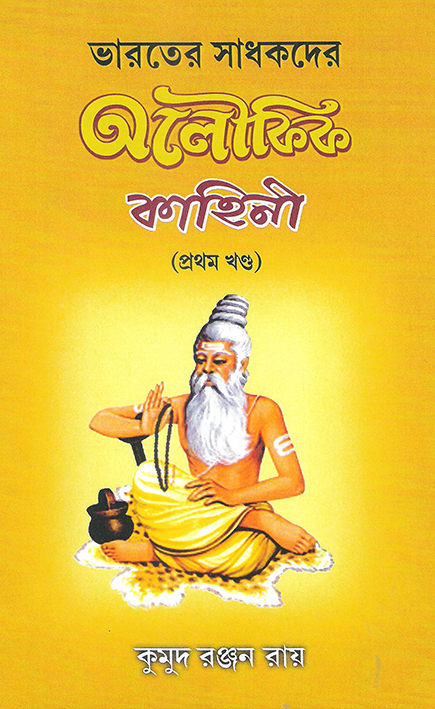 He told Shankar, “Not only you have earned wisdom in all scriptures, you have earned the ‘Jog Bibhuti’ as well. I want to bliss you, tell me what do you want”. Shankar humbly replied,” Gurudev at your bliss I have attained everything I wanted in my life, now bliss me so that I can leave the mortal body and unite with God”. Shankar’s age was sixteen at this time. Govindapad paused for a while and extended his vision into the future with half-closed eyes and said,”No Shankar, it is not yet your time to go. God has sent you to fulfill certain mission. You have to lit the light of ‘Addaitya Brahma’ (non-dualism or concept of One God) into the masses”. At Guru’s directive Shankar left ‘Onkarnath Hill’ and set out for Kashidham (Benaras) and established his temporary abode near Manikarnika Ghat. After Shankar left ‘Onakarnatth Hill’ Govindapad engaged himself in a deep meditation from which he never woke up. Shankar started to preach his new definition of Vedic message the ‘Addaitya Brahma’. . He said, Brahma is only real, everything else is unreal and dream. Brahma resides inside everything in the creation. But this concept was not easily understandable by ordinary masses. One day he saw ‘Bababiswanath’ of Kashi in his vision who advised him to go to Himalayas and create his own version of ‘Upanishad’ and ‘Brahmasutra’. He immediately set out for a secluded place in the Himalayas and established his abode at the juncture of Alakananda and Keshabganga which was filled with sacred memories of ‘Mahamuni Bayshdev’. Here he created his own version of sixteen religious books. He again started traveling different parts of India to preach his message of ‘Adaitya Brahma’. He preached Brahma and all living being are same and indivisible. Man can not see it because they are covered by the darkness of ‘Maya’. Only the light of knowledge can remove this veil of darkness created by ‘Maya’. Sankar realized that he has to conquer the religious leaders to establish his message to the masses. He defeated many religious leaders in debates and they offered their obedience to Sankar. He also defeated the most powerful religious leader Mandan Mishra, but his wife Uvoybharati refused to accept the defeat until Sankar can defeat her as well. Uvoybharati wanted a debate on “Kamsutra” (the science of love making). Sankar was never married and lacked the knowledge of “Kamsutra”. By meditation Sankar found out that a young king died a little while ago and his body would be taken for cremation soon. Sankar told his disciples to guard his body till be comes out of the cave and cautioned that nobody should touch his body. Sankar’s soul left his body and entered the body of the dead king while the body was on funeral procession. The king opened his eyes and started talking. The procession went back to the palace. Sankar resided in the king’s body for a while and learned Kamsutra from the queen. After Shanksr’s missin was accomplished , he left the king’s body and the king dropped dead again. However, Uvoybharati accepted a defeat even without a debate. Acharjya Shankar has come to pay a visit to the daiety at the Mounantika Temple. As soon as he came out, a poor a Brahmin couple stood in front of him with their only son’s dead body. They were almost mad in grief and begged for Shankar’s pity. Shankar’s mind became filled with sorrow. He put his necklace of flowers on the boy’s head and the boy opened his eyes and woke up from his eternal sleep. One day Sankar was teaching scriptural lessons to his disciples, all on a sudden he started tasting mother’s milk in his mouth. He immediately absorbed himself in meditation and learnt that his mother was at death bed. But Kanari village in Kerala is far away from Shringeri and would take several days to go. Mother would not survive that long. He applied his divine power and was at mother’s death bed in a few moments. Mother and son braced each other after twenty four years of separation for the last time on this earth. Sankar established four Ashrams in different parts of India – Sarada Math in Dwaraka, Gobardhan Math in Puri, Joshi Math at Jyotirdham and Shringeri Math in Rameswar and gave management responsibility to four of his highly spiritual disciples. 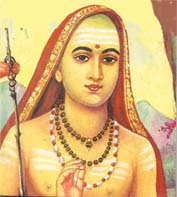 In 820 at the age of thirty two, Sankaracharya realized that he had fulfilled the mission God wanted him to accomplish. He expressed his desire to the disciples to leave the mortal body. Sankar sat in “Mahasamadhi” (deep meditation) and all his disciples started chanting divine hymns. He never woke up from that meditation.